CVGHM reported that seismicity at Seulawah Agam increased during 27 December-2 January. Visual observations were prevented due to fog, although on 2 January scientists observed a new solfatara that produced roaring noises and was within 20 m of van Heutsz Crater on the NNE flank. The Alert Level was raised to 2 (on a scale of 1-4) on 3 January. Seulawah Agam (also known as Seuleuwah Agam) volcano, one of three active stratovolcanoes in the Aceh province (>5 million inhabitants), is located at the NW tip of Sumatra. Seulawah Agam has two craters, van Heutsz (Heszt), the most active crater at an elevation of 714 m on the N flank, and Simpago on the S flank. The Indonesian Center of Volcanology and Geological Hazard Mitigation (CVGHM) reported that activity at Seulawah Agam is generally characterized by white plumes rising ˜1 m from the crater. Seulawah Agam has remained non-eruptive through at least 2 January 2013. Historical data indicated that Seulawah Agam volcano last erupted 12-13 January 1839 on its NNE flank (van Heutsz crater). Prior to that, an eruption occurred in 1510 (˜10 years), also on its NNE flank. During October 2010-July 2011 overall activity at Seulawah Agam decreased; seismicity, water temperature, and magmatic gas emissions decreased, but pH measurements were stable and no significant changes at the surface were observed. The volcano was often shrouded in fog during this period. On 11 July 2011 the Alert Level was lowered from II to I. Beginning on 27 December 2012 (table 3), there was an increase in deep volcanic seismicity over the course of the following week. Visual observations were often prevented due to fog, although on 2 January 2013 scientists observed a new solfatara (a natural volcanic steam vent in which sulfur gases are the dominant constituent, along with hot water vapor) that produced roaring noises and emissions which drifted ˜20 m out from van Heutsz Crater. On 3 January 2013 the Alert Level was raised from I to II; then, on 11 May 2013, the Level was lowered to I. Table 3. Daily numbers of earthquakes measured at Seulawah Agam volcano from the week 27 Dec 2012-2 January 2013. Courtesy of CVGHM. Information Contacts: Center of Volcanology and Geological Hazard Mitigation (CVGHM), Jalan Diponegoro No. 57, Bandung 40122, Indonesia (URL: http://proxy.vsi.esdm.go.id/index.php). CVGHM reported that during October 2010-July 2011 activity at Seulawah Agam decreased. Measurements indicated that seismicity decreased, water temperature decreased and pH levels were stable, gas emissions were lower, and no significant surface changes were observed. The Alert Level was lowered to 1 (on a scale of 1-4) on 11 July. CVGHM reported that although seismicity from Seulawah Agam fluctuated during April to August 2010, the data reflected increased activity overall. On 1 September, CVGHM raised the Alert Level to 2 (on a scale of 1-4) and restricted visitors from approaching the crater within a 3-km radius. This is our first report on Seulawah Agam, which has not erupted since a phreatic eruption in 1839. Beginning in April 2010, the seismicity increased at the volcano (table 1). However, visible signs of unrest were absent, although the volcano often is covered by fog. Table 1. Types and numbers of volcanic earthquakes recorded at Seulawah Agam during April-August 2010. Background levels prior to increased April activity were not available. Courtesy of CVGHM. On 1 September, based on the increase in seismicity, the Center of Volcanology and Geological Hazard Mitigation (CVGHM) raised the Alert Level to 2 (on a scale of 1-4) and restricted visitors from approaching the crater within a 3-km radius. Seismicity at Seulawah Agam volcano, Indonesia, caused the Center for Volcanology and Geological Hazard Mitigation (CVGHM) to raise the Alert Level from 1 to 2 (on a scale from 1-4) from 1 September 2010 through 11 July 2011. According to historical records, Seulawah Agam last erupted in 1839, although the likelihood and character of that eruption is in debate. The summit of Seulawah Agam hosts a forested crater ~400 m wide (figure 1). The volcano also hosts several active fumarole fields, such as those in the van Heutsz crater, which sits on the NNE flank at ~650 m elevation (figure 2). Figure 1. (Index map) The location of Seulawah Agam at the NW end of Sumatra island. (photo) Annotated aerial photograph of Seulawah Agam taken on 19 November 2007 looking SE, showing the ~400-m-wide, vegetated summit crater (white dashed outline). Photograph courtesy of Michael Thirnbeck; index map modified from MapsOf.net. Figure 2. Hazard map of Seulawah Agam. Hazard Zones I-III (from outer to innermost) consist of both circular areas (indicating hazards from material dispersed through the air) and irregularly shaped areas (funneled by topography along the ground). Courtesy of the Center for Volcanology and Geological Hazard Mitigation (CVGHM). The hazard zones, as with all other monitored Indonesian volcanoes, concern airborne ejected/explosive material (circular zones delineating areas prone to ash fall and/or pyroclastic bombs) and ground-traveling, topographically controlled processes (irregular shaped zones delineating areas prone to lava flows, pyroclastic flows, and/or lahars); each Hazard Zone level (I-III) thus delineates a circular and an irregular area. At Seulawah Agam, the hazard zones are centered at the summit of the volcano. The van Heutsz crater, however, is located outside of the 2 km radius of Hazard Zone III, but within the topographically prone area of Hazard Zone III. Seismicity increase. Beginning in April through September 2010 seismicity fluctuated at Seulawah Agam, although increased overall, indicating increased activity of the volcano. The Jakarta Post reported that CVGHM recorded 80 volcanic earthquakes during August 2010, the equivalent of nearly 3 volcanic earthquakes per day. On 1 September, CVGHM raised the Alert Level to 2, and restricted access to areas within 3 km of the summit crater (figure 2). According to CVGHM, seismicity fluctuated at elevated levels from October 2010 through June 2011. In July, seismicity was still elevated above the baseline during October 2010-June 2011. However, the occurrence of shallow volcanic earthquakes was reduced compared to recent trends (table 2). Table 2. Seismicity at Seulawah Agam during 1 October 2010-10 July 2011. The Alert Level was lowered from 2 to 1 (on a scale from 1-4) on 11 July 2011. Data courtesy of the Center for Volcanology and Geological Hazard Mitigation (CVGHM). CVGHM also reported that comparison of data from October 2010 and February 2011 indicated a decline in the emission of volcanic gases, a stabilization of the pH of crater waters, and a decrease in the measured temperature of fumaroles. On 11 July 2011, CVGHM lowered the Alert Level to 1, restricting access only to the summit crater. Information Contacts: Center for Volcanology and Geological Hazard Mitigation (CVGHM), Jl. Diponegoro 57, Bandung, West Java, Indonesia, 40 122 (URL: http://www.vsi.esdm.go.id/); TheJakarta Post, Jl. Palmerah Barat 142-143, Jakarta 10270 (URL: http://www.thejakartapost.com/); Michael Thirnbeck (URL: http://www.flickr.com/photos/thirnbeck/); MapsOf.net (URL: http://mapsof.net/). Seulawah Agam at the NW tip of Sumatra is an extensively forested volcano of Pleistocene-Holocene age constructed within the large Pleistocene Lam Teuba caldera. A smaller 8 x 6 km caldera lies within Lam Teuba caldera. 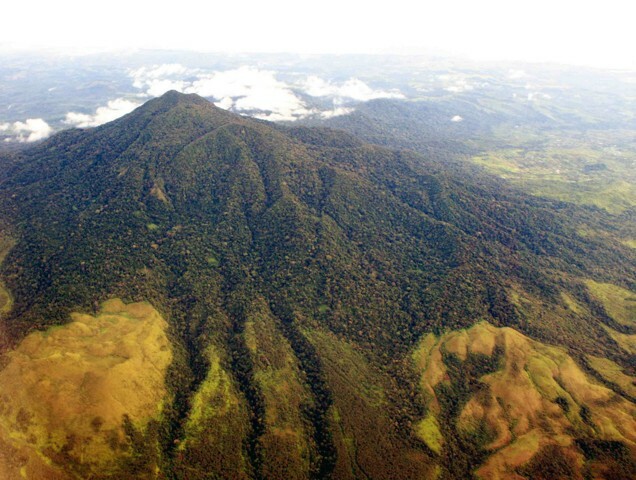 The summit contains a forested, 400-m-wide crater. The active van Heutsz crater, located at 650 m on the NNE flank of Suelawah Agam, is one of several areas containing active fumarole fields. Sapper (1927) and the Catalog of Active Volcanoes of the World (CAVW) reported an explosive eruption in the early 16th century, and the CAVW also listed an eruption from the van Heutsz crater in 1839. Rock et al. (1982) found no evidence for historical eruptions. However the Volcanological Survey of Indonesia noted that although no historical eruptions have occurred from the main cone, the reported NNE-flank explosive activity may have been hydrothermal and not have involved new magmatic activity. Bennett J D, Bridge D M, Cameron N R, Djunuddin A, Ghazali S A, Jeffery D H, Keats W, Rock N M S, Thompson S J, Whandoyo R, 1981. Geologic map of the Banda Aceh quadrangle, North Sumatra. Geol Res Devel Centre Indonesia, 1:250,000 scale. Rock N M S, Syah H H, Davis A E, Hutchison D, Styles M T, Lena R, 1982. Permian to Recent volcanism in northern Sumatra, Indonesia: a preliminary study of its distribution, chemistry, and peculiarities. Bull Volcanol, 45: 127-152. There is no Deformation History data available for Seulawah Agam. There is no Emissions History data available for Seulawah Agam. 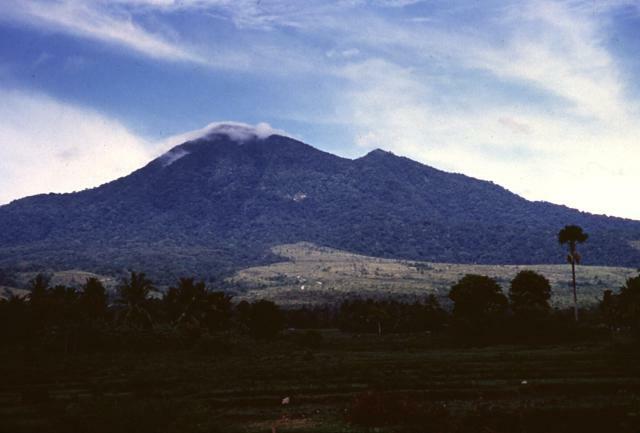 Seulawah Agam, rising above farmlands on its eastern flank, is an extensively forested volcano of Pleistocene-Holocene age located in the province of Aceh at the NW tip of Sumatra. Gunung Seulawah Agam was constructed within the large Pleistocene Lam Teuba caldera and a smaller 8 x 6 km caldera. Wispy clouds drape the summit, which contains a forested 400-m-wide crater. The van Heutsz crater, located at 650 m on the NNE flank, is one of several areas containing active fumarole fields. Seulawah Agam, rising above farmlands on its flank, is seen here with the northern coast of Sumatra in the background. This extensively forested volcano of Pleistocene-Holocene age is located in the province of Aceh at the NW tip of Sumatra. Gunung Seulawah Agam was constructed within the large Pleistocene Lam Teuba caldera and a smaller 8 x 6 km caldera. The summit contains a forested 400-m-wide crater. Copyrighted photo by Michael Thirbeck, 2007. There are no samples for Seulawah Agam in the Smithsonian's NMNH Department of Mineral Sciences Rock and Ore collection. Large Eruptions of Seulawah Agam Information about large Quaternary eruptions (VEI >= 4) is cataloged in the Large Magnitude Explosive Volcanic Eruptions (LaMEVE) database of the Volcano Global Risk Identification and Analysis Project (VOGRIPA).